Become a volunteer! Apply now! UC Davis Arboretum and Public Garden volunteers renovate an area in the Arboretum’s East Asian Collection with shade-loving plants that also attract hummingbirds. UC Davis Arboretum and Public Garden volunteers gain horticultural experience while maintaining campus scientific collections, demonstration gardens, and naturalized landscapes. WOULD YOU LIKE TO SPEND MORE TIME OUTDOORS? Would you like to learn more about the environment? Are you looking for a way to fulfill a New Year’s resolution to give back to the community? Consider volunteering with the UC Davis Arboretum and Public Garden! It’s a rewarding place to spend your time while learning new skills and meeting new people. 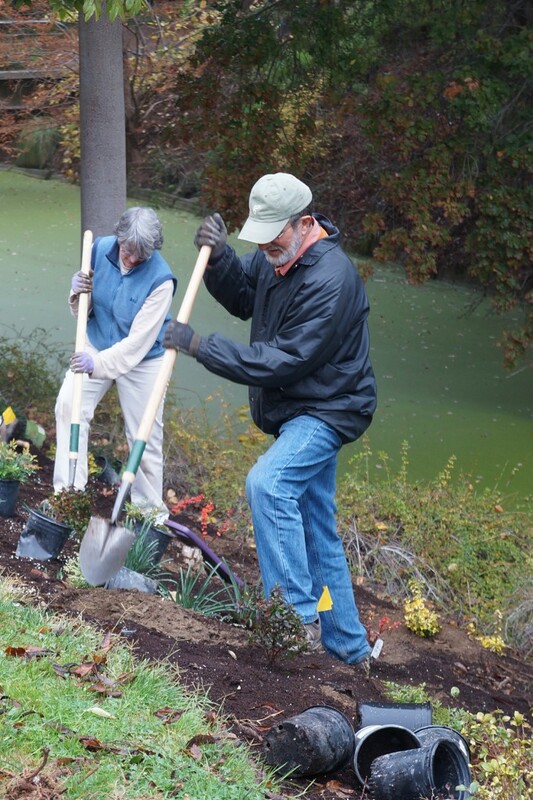 We are seeking new volunteers to join our gardening and land stewardship volunteer teams. Trainings will be offered this winter and include a combination of expert instruction and hands-on projects. PLEASE NOTE: There will be a $20 materials fee due at your team’s first scheduled training date. Training dates: Thursdays, January 28-March 3, 9 a.m.–12 p.m.
NEW! LAND STEWARDSHIP VOLUNTEERS work on the Putah Creek Riparian Reserve and campus naturalized lands with staff on Tuesday, Wednesday or Thursday mornings. Projects include light construction, trail repair, native plant care, weed control, and a variety of equipment and power tool operation. Training dates: January 26, 27 or 28, 9 a.m.–12 p.m. APPLY NOW. SPACE IS LIMITED. Applications are due Friday, January 15. The application form and more information are available on the Arboretum website at arboretum.ucdavis.edu and below. If you have questions, please contact Roxanne Loe at (530) 752-4880 or rgloe@ucdavis.edu.